When making a successful zombie movie, you need to create a real sense of looming disaster over the protagonists, flesh out those characters so you get a sense for where their fear is coming from, and it doesn't hurt to have some nice gore effects to round things out. When making an unsuccessful zombie movie, you can pretty much do whatever. Use crappy cameras, minimize screentime for your zombies, don't bother lighting your scenes, ignore the rules of pacing; it's a free-for-all when you don't care about what it is that you're making. 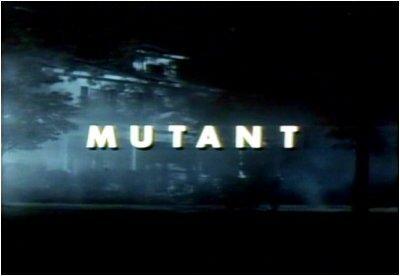 Mutant is a film from 1984 where the director has done all of these things and more. Technically, it's a film about mutants, but apart from a few minor physiological differences, what you have here is a zombie movie that refuses to call itself as much. In fact, it refused to call itself anything original, instead opting to take the title from an earlier movie that was also only tangentially related to mutants. This Mutant was eventually renamed "Night Shadows", which sounds more like a gothic metal band than a film. Whatever you call it, it blows. With that in mind, enjoy Mutant. Our story opens with a lanky fellow wandering around a house at night. Around the back, he starts taking samples from some brackish water. The man decides that the homeowner should know about the leaking septic tank, so he sneaks into the house through the cellar. He starts to second guess the whole "sneaking into a stranger's house" thing when he stumbles on a dead body. He turns to run, but runs smack into some large person who holds him aloft for a few seconds. So he's dead, and he's having a smoke break. Bad combination. Here are two of the real protagonists: brothers Mike and Josh. Josh is a jerk, and Mike walks around with his shirt unbuttoned all the time. Neither point is ever addressed in the film. Mike is upset that they gotten completely lost. Josh reassures him that they are in good hands the only way he can think of: by closing his eyes and drifting all over the road. Incredibly, this does not work out for him. Some urgent honking gets Josh to open his eyes and crank the wheel just in time to avoid a head-on collision with a truck full of rednecks. That they came within inches of having their vacation cut short amuses Josh to no end. A little jolt, he explains to his brother, is good for you. If that is true, then he'll love what happens next. The rednecks they nearly killed did a quick U-turn and are now ramming them. Josh, being a jerk himself, accepts their challenge, and the two vehicles begin sideswiping each other. Unfortunately, Josh's convertible doesn't have quite as much ramming power as the truck. One good slam puts their can off the road and right into a creek. The rednecks pull alongside the bridge to gloat at the defeated Josh and Mike. Mike is worried that might be murdered by these lunatics, but again, Josh is a jerk. He shouts threats as best he can from his position. If he fights as well as he drives, then he should be doubly thankful that the rednecks decide to drive off without any further reprisals. And so our heroes take a long walk. 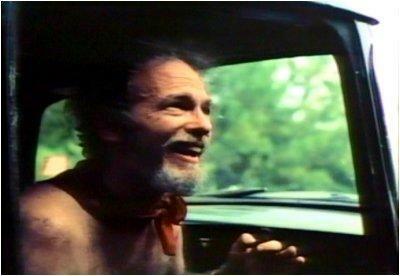 Along the way, Josh recovers his spirits, no longer worked into a blind rage by hill folk. He assures Mike that they will be fine. There's no reason to believe that any more harm will come to them. I mean, what are the odds that a guy like Josh will make any more stupid mistakes like that? 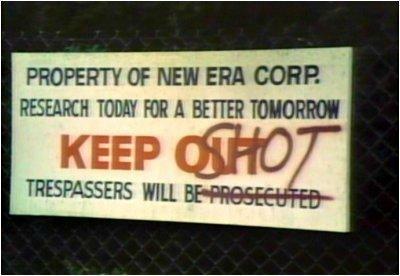 In a bit of foreshadowing, the brothers happen upon a warning sign from the New Era corporation: "Keep Oshot, trespassers will be... something." I don't know what that means, but I'll bet that someone is playing Dueling Banjos somewhere inside that fence. With no end of walking in sight, Mike opts for a little thumb play. None of the passing motorists go for it, so Josh goes for a bolder sort of hitchhiking: stand in the middle of the road and flag someone down. It kind of works when he is nearly run over by an old pickup truck. The driver introduces himself as Mel. As soon as I saw him, I was glad they didn't shoot this movie in smell-a-vision. Mel claims he didn't see Josh in the road, and offers to give them a ride to the gas station as an apology. Hey, why not? The last group of locals they encountered seemed like nice enough people. On the way, Mel explains why he has a shotgun sitting upside down in his gun rack: he's a hunter. A hunter of "anything that's running away". Again that seems like a big red flag, but the two city boys remain calm. Mel explains that recently he was shooting at "little green men," though he isn't sure if they were aliens, or just perverts. Not that it matters to a guy like Mel. He goes onto say that the last group of visitors to come through the area disappeared suddenly, with indication as to what lead to the disappearance. My guess: people like Mel. Fate once again smiles on our heroes as Mel suddenly decides he has somewhere to be, so he drops them at a fork in the road. Before they part ways, Mel once again warns them not to be out after dark. 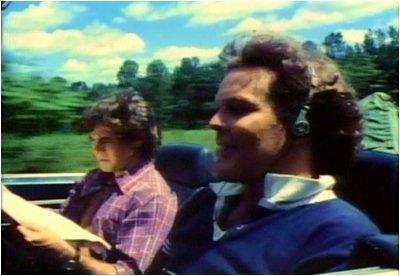 As Mel is driving away, we see him call someone on his CB radio to let him know a pair of young men are on their way. I get the feeling those two are going to be squealing like pigs before the movie is over. In spite of Mel's promise that a gas station was only a mile up the road, it is nightfall by the time our heroes reach the town of Goodland. There's no sign of a gas station, but there is a sign for a bar. Mike immediately forgets their present circumstances and suggests they get drunk. It's as if Josh is determined to become one of those missing tourists Mel mentioned. A short distance away, a drunk is strangled by someone. Mike wants to investigate the screaming, but Josh just wants to get wasted, get into a bar fight, lose his wallet, take some roofies, wander into a corn field, and wake up in a bathtub full of ice. If there is time after he is completely doomed, then he'll start investigating every bloodcurdling scream he hears. A man who is dead drunk. Literally. Judging by the sores on his face, he must've tried to shotgun a bottle of bleach. Mike wants to call the police, but Josh just wants to get his fingerprints all over the corpse. He does finally relent to Mike's wishes because, if nothing else, calling the police gives them excuse to go into the bar. Mike enters, leaving his shirt unbuttoned so he'll blend in with the immodest and unwashed patrons. Unfortunately, before he can get to a phone, he encounters the crazed rednecks from before. Josh joins them for a discussion about who started the fight on the road, and which one of them is going back to live in "fancy condominiums" in the city. Not surprisingly, a bar fight breaks out. In the midst of the awkward fight, Mike and Josh briefly gain the upper hand. The lead redneck, Albert, pulls out a knife, but Mike disarms him. Josh is jumped by a pair of rednecks, but he fends them off without too much trouble. Eventually, though, they are brought down. The fight ends in a nick of time as the sheriff steps in. Albert's assault-with-a-deadly-weapon charge is downgraded to a mere warning, but that's not enough for him. He mocks Stewart for screwing up something in the big city. Something so bad that they exiled him to this rotten podunk town. I don't know what it was that he did, but I'm willing to bet it involved drinking on the job. 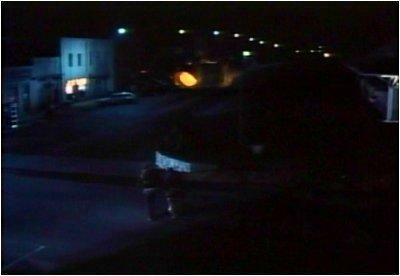 Just then, Mike remembers the dead body in the alley. He grabs the sheriff and leads him to the scene of the crime. Only now there is no crime, apart from loitering. 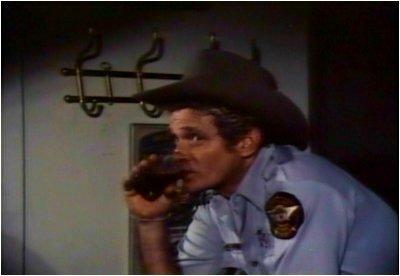 The sheriff quietly shoos away the drunken bum, thus proving that he is still a capable police officer several beers in. Annoyed at having to do his job, he gives Josh and Mike the usual "I want you outsiders gone by morning" speech before giving them a ride to the doctor's office. 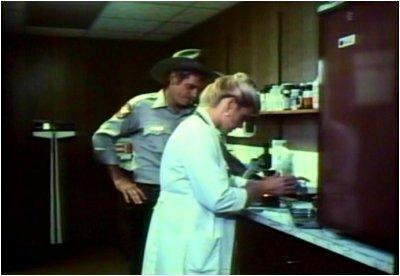 Before leaving, the sheriff scoops up some strange yellow goo from the spot where the bum was laying. So he's too lazy to bring in the violent, ill-tempered redneck who tried to kill two people, but the minute he spots some weird slime, it turns into CSI Goodland? Myra, the local sawbones, is a little more sympathetic regarding Mike and Josh's near death experience. She asks the sheriff to put the boys up at Mrs. Mapes' place. She's lonely, you see, and any drifters who roll in off the street will do for company. Before taking off, the sheriff shows her the container of hobo leavings he scraped up in the alley. Now, for some reason, the container is burning hot. Myra agrees to look at the goo, even though she's just a GP and isn't likely to have any insight into what the mysterious substance might be. The sheriff drops Josh and Mike off at Mrs. Mapes place. He doesn't introduce Mrs. Mapes to the young men and ask if she wouldn't mind putting them up. He just drops them off, with a few more warnings about getting out of town. Mrs. Mapes has no problem accepting the strangers into her home, so everything worked out. The moment's rest gives Mike some time to call his brother out on not having his back when that corpse vanished. Josh refuses to even acknowledge that there was ever a body. Furthermore, he mocks his brother, in spite of the fact that he basically got his brother stabbed by a crazed redneck that he enraged. Josh's complete lack of contrition doesn't bother Mike in the least, for whatever reason. They kiss and make up before going to bed. In the middle of the night, Mike hears a noise coming from under his bed. He takes a peek and doesn't see anything. Even so, a pair of arms reaches out and pulls him under the bed. Josh hears the screaming, but dismisses it almost immediately. At this point, the terror is palpable: will the rest of the movie center on Josh, with his dickhead antics and Art Garfunkle haircut? Morning comes, and there's no sign of Mike. Mrs. Mapes claims not to have seen him, but he did leave all his stuff in his room. He probably just went to wander around the town he was in such a hurry to leave last night. And that screaming last night? Not even worth asking about. Josh heads to the gas station to see about a tow, but it's closed. Everything is closed, as a matter of fact. Everything except Jack's Bar, the place where Josh almost ate a beer bottle. Josh goes right in. There's no sign of the bartender from last night, but he does meet Holly, the bartender's niece. She tells him that the gas station has been closed all week, but that there is another one that is open. Four or five miles away. The setback is substantial enough to make Josh start drinking. Holly tells him mid-beer that she can give him a lift because the station is near where she teaches. Or at least where she would be teaching, save that all her students have caught the mysterious flu that's sweeping the town. Meanwhile, the doctor explains to the sheriff that the substance he found is blood, but with some kind of additive that makes it yellow. What's more, when she spilled some of it on a bloody bandage, it absorbed the blood and grew. Moments later, the sound of glass breaking alerts them to a burglar in the back room. There's still more of Mutant to see! Apparently, the guy who did the lighting for this movie later went on to light Midnight Meat Train. The collapse of FVI can't hold you back when your uncle owns a powerful Dramamine-selling business. I cannot believe the guy that brought us Kingdom of the Spiders also directed this. What a disappointment. He should have stuck to a KOTS sequel. Or had Rack Hanson star in this one. Either would have worked. I can't get past the screen cap that has Josh and Myra standing in front of the "No Assing" sign. I've just added this to my VHS collection.